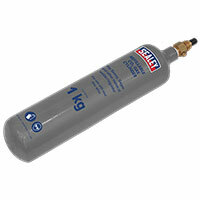 Portable sized CO2 refillable gas cylinder. Gives value for money repaying investment in just a few fills. Suitable for Sealey and other brand portable MIG welders/regulators. Refill exchange service available through local distributors. Portable sized CO2 refillable gas cylinder. Gives value for money repaying investment in just a few fills. Suitable for Sealey MIG welders. Will also fit other makes of welder/regulator. Refill exchange service available through local distributors. Sealey are one of Europes largest tool and equipment brands with nearly 8000 products available from its extensive catalogue. Sealeys products are backed by an excellent 12 month guarantee and their hand tools benefit from a lifetime warranty, giving purchasers added peace of mind. This family owned company have huge stocks and can deliver pretty much anywhere in the country the next day on a premium service. Sealey are big on service and their parts service is second to none. Currently with over 130,000 different parts in stock, Sealey can supply parts for all their products from a circlip to a compressor tank, generally from stock check Sealeys website for their on-line instructions and parts lists.